Berlin, the grey city: Only 1625 hours of sunshine, over 100 rainy days and mostly cloudy the rest of the year. But not everything is grey about Berlin as it is also home to 3.47 million people from 185 countries. It has a lot to offer for everyone who wishes for something, — except for the sea — but well, there are quite a number of lakes to enjoy the sunshine, too. The capital of Germany is in fact an important hub for Europe covering diverse innovation in various sectors. 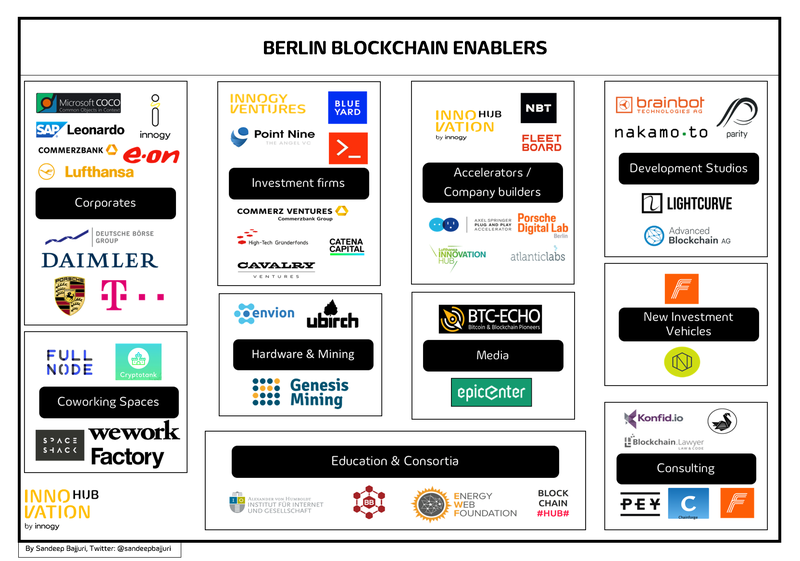 We, at the innogy Innovation Hub, have decided to create an overview over the blockchain ecosystem in Berlin. Therefore, we mapped all startups/projects working in the space alongside with enablers including the investment firms, accelerators, co-working spaces and many more. Although, we don’t know for sure which blockchain project was the very first that originated in Berlin (please add a comment below if you are wiser than us! ), we are happy to see that the early pioneers (starting around 2012) are being joined by so many more nowadays. The community is growing quickly and great people are moving to Berlin not only from Germany but also from across the world to contribute to one of the great projects or even start their own company from here. The image below is a collection of all the startups/projects that have either been founded and/or are active in the ecosystem with at least one or more employees working from here. To gain a better overview of the Berlin blockchain startup ecosystem, we have classified the projects into three layers: the infrastructure layer, the middleware layer and the decentralized application (dApp) layer. Please note that some companies might be working in several of these layers, hence the categorization is only an orientation guideline. In the following, we will present you 3 projects per layer in more detail. In the Infrastructure layer we find decentralized processing engines, storage and data bases. A decentralized processing engine can be used to validate transactions or to put (parts) of a business logic on a blockchain (e.g. with Ethereum smart contracts). A chain comes with a pre-defined consensus mechanism and system rules (e.g. block size, who can be a validator etc.). Popular projects on the infrastructure (processing) layer are Ethereum or IBM Hyperledger. Decentralized file storage is offered by IPFS/Filecoin. From the Berlin ecosystem, we chose Lisk, BigchainDB and Aeternity as popular projects in the infrastructure layer. Lisk has an active community and recently relaunched. BigchainDB is one of the early projects in the crypto scene in Berlin and one of our first investments from the Innogy Innovation Hub. With high throughput, sub-second latency and powerful crypto-condition escrow functionality to automate release-of-assets, BigchainDB should look, act and feel like a database but has the core blockchain characteristics that enterprises want. æternity is a blockchain trying to solve some of the most prominent current challenges in the Ethereum network: efficiency, transparent governance and global scalability. Their core innovations, as claimed on their website, are smart contracts in state channels, decentralized oracles, a PoW/PoS hybrid consensus algorithm and a prediction market fueled governance model. Aeternity is incorporated in Liechtenstein and partly based in Berlin. In our classification, the “Middleware Layer” defines projects that are building a bridge on top of underlying infrastructure (e.g. on public chains). These can deal with topics like scalability, ease of use, payment gateways, connectivity etc. Basically it’s a layer that enables the application layer to be able to communicate with the infrastructure layer (if needed). Some dApps might be building directly on to what we call the “Infrastructure Layer”. Some of the interesting projects in this space are OST (Simple Token), Cosmos and Raiden Network. OST is a protocol for consumer-app tokenization and an ERC-20 utility token that allows any consumer-facing marketplace to design, launch, and manage their own branded tokens on open, scalable side-chains without the costs, risks, and complexity associated with blockchain technology. OST, the company behind Simple Token have recently invested $5M into the Unsplash platform, to tokenize the images on the platform and bring blockchain into the mainstream. The Cosmos Network enables interactions between different blockchains. Cosmos is being developed by the Tendermint team. The Raiden Network is an off-chain scaling solution for Ethereum, enabling near-instant, low-fee and scalable payments; it works with ERC-20 tokens. Raiden is currently under development; it’s being built by Brainbot Technologies. Brainbot Technologies is a blockchain development studio, creating the core building blocks to scale the technology towards broad adoption of public blockchain systems. A technology becomes valuable when it is accessible and usable in the real world. The application layer is a collection of dApps which can be used either by humans or machines. Some examples in the space with presence in Berlin are Gnosis, Hicky and Bitwala. Gnosis is a prediction platform which can enable market-driven forecasting with a revolutionary P2P approach. Gnosis has already developed several dApps, amongst which are the Gnosis Olympia prediction market as well as the Gnosis multisig wallet. Jolocom provides an user owned and controlled blockchain self-sovereign digital identity solution. The main focus on the Jolocom product lays on the fact, that the identity can be truly owned by the user (and not by the third party controlled “trust industry”). Bitwala aims to offer a banking service which merges crypto and fiat. The Bitwala wallet enables easy bitcoin payments in a secure and convenient way. Bitwala started in Berlin in 2014; the founders have been active in the blockchain space even since 2012. They clearly belong to the early pioneers of the Berlin ecosystem! If you are wondering about the distribution of decentralized teams in the blockchain space, you might be interested in the Global Connectedness Index from Startup Genome. This shows the connectedness of startup founders across the world and we are certain that a similar degree of connectedness can be observed in Blockchain startups. After BUIDL, which is clearly the most important activity in blockchain right now, for us the second most important thing to bring blockchain and the whole ecosystem forward can be defined as ENABL. The growth of any ecosystem is only ensured when there is an active contribution from other stakeholders that are supporting towards it. We have termed these “other stakeholders” as enablers. The image below is an overview of all the active stakeholders that are supporting and contributing to the growth of the ecosystem. The Blockchain Hub is a not for profit organization created to advocate and communicate about blockchain and other decentralized solutions to “non-techies” through showcasing use cases and workshops, as well as publishing very comprehensive articles. With these activities they make sure that blockchain stays an inclusive ecosystem and knowledge is shared across disciplines. The Energy Web Foundation is a global not for profit organization which is focused on accelerating the use of blockchain in the energy sector. Together with their 24 affiliates, most of them being utilities, EWF has developed the Tobalaba Network which is a test net for the energy web. The EWF was co-created by the Rocky Mountain Institute and Grid Singularity. The Bundesblock (German Blockchain Bundesverband) is a federation which has been formed 2017 to promote blockchain technology in Germany. They are demanding more innovation-friendly regulations in Germany with regards to blockchain as well as pilot projects in the public administration domain. They are publishing position papers as well as information material about the status quo of blockchain activities in Germany on a regular basis. The innogy Innovation Hub also actively supports get-togethers of the community by providing our space and support and hosting events at our premises. Previous meetups co-organized by us include Ocean Protocol meetups, 9984 meetups and the BlockShow Berlin meet-up. For those who want to stay connected with the Berlin blockchain ecosystem, there is a dedicated slack group known as BerChain, and also a blockchain channel in the Startup Berlin Group slack. Last but not the least, if you are wondering about the places where these people work from, here are the links of a couple of co-working spaces where some of the blockchain startups are based or frequently host meetups. 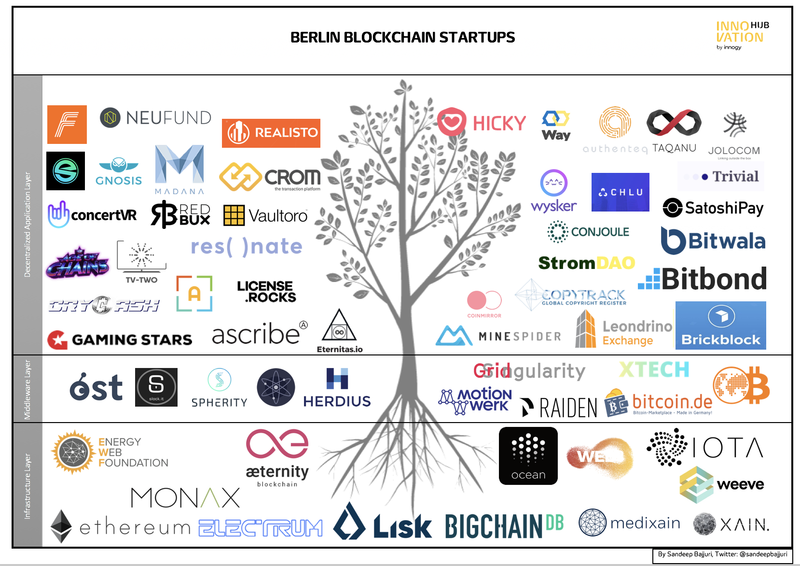 We could continue listing more activities, great companies and valuable enablers in the Berlin blockchain space infinitely, but we hope that this crisp overview is a helpful start and made you curious about the Berlin Blockchain ecosystem. If this wasn’t enough for you yet: Here is a link to the google spreadsheet which has short details about all projects based in (or partly working from) Berlin. Please excuse us if we have missed any project or enabler and feel free to add them collaboratively to the spreadsheet! With all that being said, if you haven’t yet experienced the Berlin spirit, come and visit us sometime! 📩 If you are a startup working on a blockchain venture, please feel free to contact us!